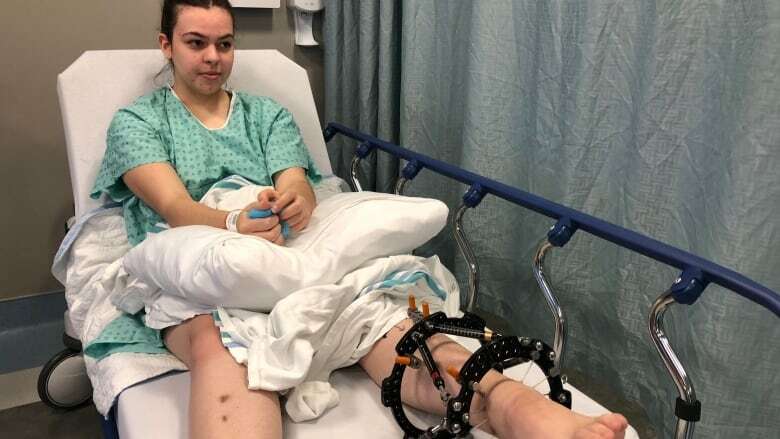 Catherine Bélanger, 16, started experiencing debilitating pain in her legs nearly three years ago. Until earlier this year, no one knew why. On Monday, she had her fourth operation in months, putting her on the road to recovery. 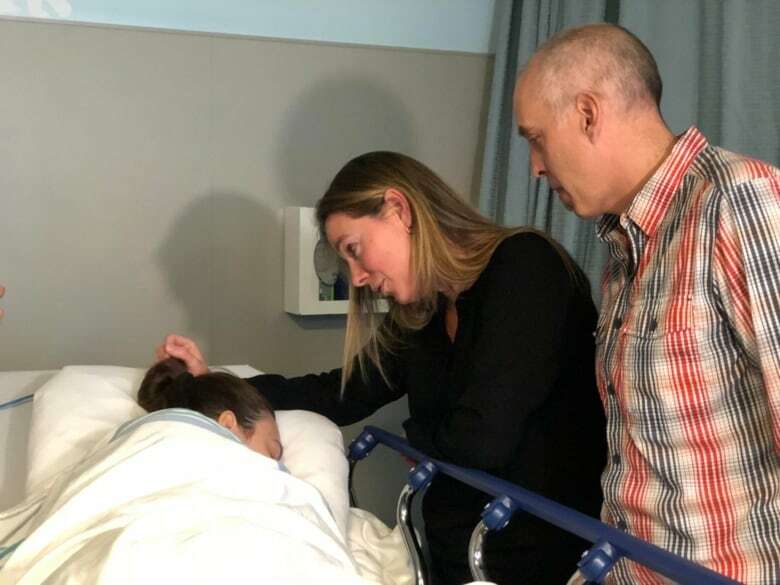 It's 7:30 a.m. Monday, and Catherine Bélanger is about to be wheeled into the operating room for her fourth operation this year. She takes a second to hug her parents, her gaze hardening briefly as she mentally prepares to go under the knife. It's been a long road for the 16-year-old and her parents. Catherine has been living with debilitating pain in her legs since her early teens. On a scale of one to ten, she says her daily pain was somewhere between seven and nine. And for a year and a half, no one knew what was wrong. Her parents, Hélène Carra and Yves Bélanger, shuttled her from doctor to doctor. None could offer a solution. She underwent multiple X-rays, but all of them came back clear. Her parents were at a loss. Catherine was on heavy doses of medication to control the pain. But more than a year after the pain began, they had no diagnosis. "She was crying and telling me that she was suffering, but I couldn't do anything," said Carra. "It was very, very hard." 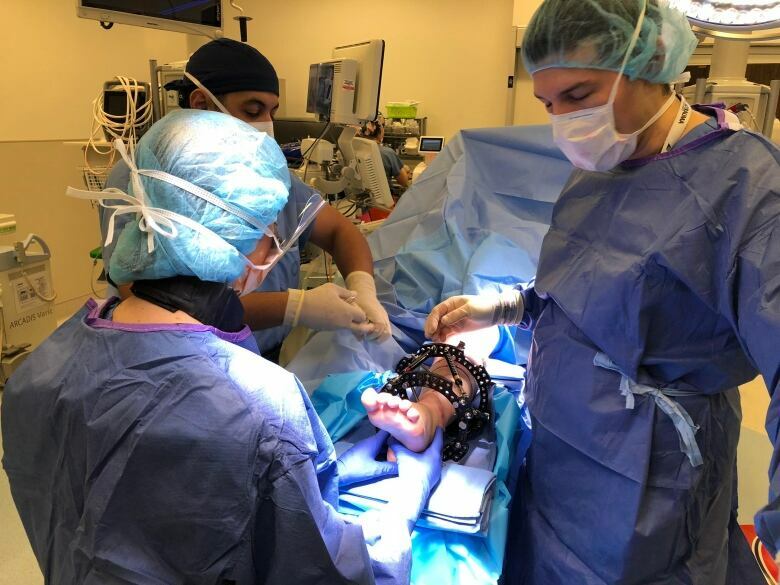 Eventually, someone suggested the family contact Dr. Mitchell Bernstein, an orthopedic surgeon at the Shriners Hospital for Children in Montreal. Bernstein listened to her describe her pain and ran some tests. Once again, the X-rays came back showing her legs were straight — but Bernstein noticed something else: Catherine's leg bones were twisted. Her femurs rotated inwards, while her tibias rotated outward. 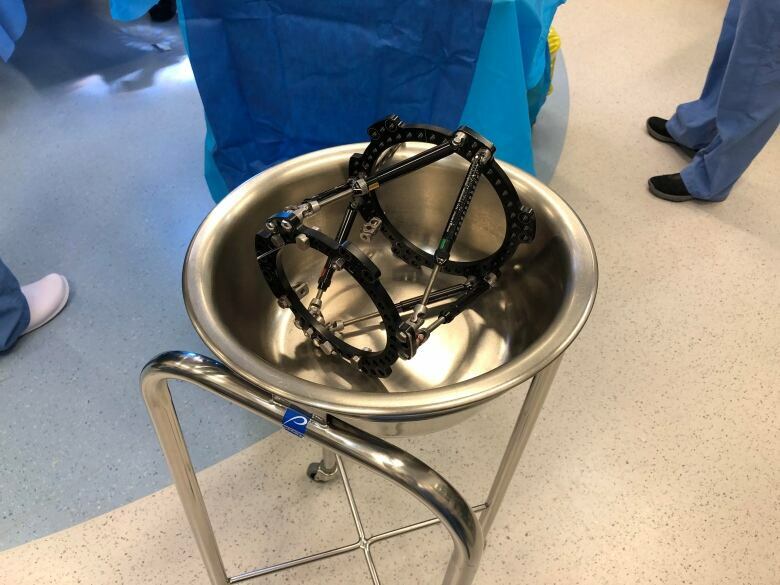 "The problem is, when you look at the patient, [the leg bones] are perfectly straight," he said. "If you have a physician who is not used to dealing with deformities, they may say nothing is wrong." Once he determined the bones were twisted, he was able to give the family a diagnosis: miserable malalignment syndrome. Carra said getting a diagnosis in early 2018 came as a great relief. But there was a catch. Once someone is fully grown, the only way to fix their legs is to break them and realign them. Catherine had to have her legs broken four times: both femurs, then both tibias. She also had a device put on both legs to hold the bones in place. "When the doctor told me he was going to break the bones in both legs, I was like … wow. That was hard," said Carra. She said Catherine initially felt some anxiety, but generally, she's been upbeat through the months of surgeries and treatment. On Monday, she underwent the latest operation, to remove the metal attached to her leg to keep the bone in place. Her team of doctors took a final X-ray after the surgery and determined the bone had healed perfectly. Examining the X-ray, you can see a line where the bone was broken — but Bernstein said that's normal. Catherine's parents smiled with relief when Bernstein shared the news. "I'm so proud of Catherine," Carra said. "She's very strong, and I'm proud as a mother to see my daughter like this." Now that the surgeries are behind her, Catherine will spend some time healing and then start physiotherapy. In time, she should have normal use of her legs — and no more pain. "I hope [today] is the last time she ever sees an orthopedic surgeon," said Bernstein.